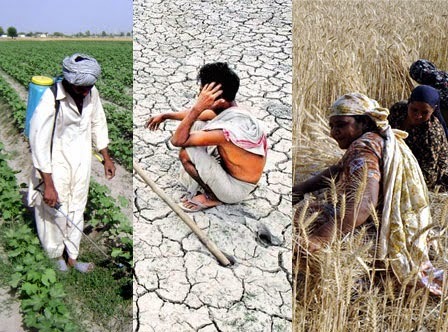 According to National Crime Records Bureau, in 2012, a total of 13,754 farmers committed suicide. It is 11.2% of all the suicides in India in 2012. This is to bring forward some of the crucial challenges faced by the Indian farming sector in particular and developing nations in general due to poor socioeconomic conditions, lack of technical knowledge, illiteracy, and awareness, small land holdings including modernization leading to barren land and calamities. These are ultimately leading the nation to rural poverty. Also weather-dependent low per-capita income, underdeveloped physical infrastructures, farming systems, and inefficient bureaucratic procedures associated with the comparatively high cost of agricultural production are also the consequences of this problem. Natural calamities and human-induced environmental degradation are closely associated with improved farming systems. India has inadequate infrastructure and services because of low expenditure. Farming equipment and infrastructure are scarce in the exteriors of the states of Punjab and Haryana. Because many of the farms are small, the farmers are unable to afford irrigation systems that would increase productivity. Most big farms are owned by the families which run and may or may not take advantage of economies of scale - the concept that the cost per each unit comes out to be as output quantities increase, because the ill presence problem off land in big farms which prevents the farming of land to increase the rate if productivity because the subject who cultivates the land is careless for its development or productivity. About 60% of the landmass is prone to earthquakes of intensities, over 40 million hectares is prone to floods, about 8% to cyclones and 68% to drought. The super cyclone in Orissa in 1999, the Bhuj earthquake in Gujarat in 2001, the tsunami in the Bay of Bengal in the year of 2004 and the floods that occurred recently in Punjab and Haryana are examples of large scale disasters in recent times. The consequences are so critical that farmers will have to take risks in farm entrepreneurship. Studies by Ajayi (1996) and Amechi (2005) have shown the positive side of impact of rural infrastructures on the lives of socio-economic rural farmers. The study identified the minimal basic infrastructure needs of farmers in the order of priority. A road network is most needed (100%), followed by storage facilities (88.2%), power supply (61.9%) and health care (53.5%). Telephone services, schools and irrigation facilities were in low availability in the study area. These infrastructures include transportation power supply, storage facilities, communication facilities, water supply along with health facilities and also many other community services. Resource-poor farmers are beset by long staying problems pouncing their productivity and contributes to the national economic output. There are two ways of looking at the problem - glass half full or half empty. If we see half-full and know that water is not a problem but a solution to our problem i.e. by innovative methods of farming which give good results with less water and innovative methods to conserve and save soil and water, then we can move forward on a well-defined sustainable path of development and eliminate rural deprivation. Rural poverty has two characteristics: the poverty of rural human beings and the second one called poverty of weather prone rural areas. The degradation of natural resource may be resulted by drought or flood as of global warming or by improved modern farming ways which affect the land adversely, making rural people poor.A major obstacle hindering the farming development is the state of transport facilities. Despite their importance, these transport systems do not function as they should do normally. Road and rail transport, the backbone for the development of any sector, are in a dilapidated condition. Agriculture in India and many other developing countries lay their trust on the monsoon as the irrigation facilities are not completely developed. If the monsoon fails or it rains heavily or untimely, it ruins agricultural production. Agriculture is also a gamble with temperature. Too high a temperature affects the productivity of a crop in a pure negative manner. The present insurance system in India does not insure much for any loss of crop due to unfavorable and unpredictable climatic conditions or pest epidemics. With groundwater, the major problem is of equity. Those who are better able to extract water take away disproportionately from groundwater aquifers, causing various problems. One is that if groundwater is close to coastal areas, it may get mixed with salt. In other places, the groundwater level drops drastically and wells go dry, making it difficult to get drinking water. First, let us consider the payment of compensation. According to the guidelines framed by the government, a family will be eligible only if the farmer who committed suicide owing to inability to repay the loan has borrowed it from a bank or a credit institution recognized by the government will be eligible. The ordinance issued to overcome the problem of usury is not likely to free the farmer from the clutches of the greedy moneylenders. The Crop Insurance Scheme, intended to take care of cases of crop failure and provide genuine relief to the affected farmers. The issue of farmers suicide cannot be looked in isolation, but from the broader perspective of the agriculture scenario in the country.